What does 1.8V to 5V operating voltage mean? Does that mean that the chip is stable with an input voltage between 1.8V and 5V? If that Is true, can I safely power the chip with 4.5V (3 AA batteries) and not have a voltage regulator? Yes, the chip is stable at 1.8V to 5V although faster speeds may not work at lower voltages (see datasheet). You should be able to safely power the chip with 4.5V, although a few words of caution. First is you don't want a power supply with spikes in it as that might damage the chip. AA batteries really shouldn't have spikes, but this is a general rule when choosing not to use a regulator. Second Alkaline AAs are 1.5V, but rechargeables are usually 1.2V meaning your total voltage on the chip would be 3.6V. The microcontroller will be fine with this, but make sure any peripherals, this will in theory limit the speed you can run the microcontroller although we often run this chip at 3.3V/16MHz even though that is outside of spec. I know it might be a lengthy subject, but maybe a short intro or a link to where I can read about those stuff? The short answer is to use an Arduino. The Arduino Uno is basically a development board for this chip providing you with things like a clock crystal, reset button, power regulation, and USB to serial adapter. But assuming you are using your own custom board, or putting that all on a breadboard or proto board the Arduino IDE is probably the easiest place to start. There is tons of example code for Arduino including example code for many of our boards. In fact the Simon kit you linked to actually uses this chip while running Arduino code. Arduino is a hard concept to explain because there are so many parts. There are the Arduino boards (and their clones) like the Arduino Uno(and the SparkFun Redboard) which provide you with the chip as well as supporting circuitry. There is the bootloader which is a piece of code that allows the chip to be easily programmed over serial instead of with a special programmer. Then there is the Arduino IDE which is a software development environment designed to make programming easier. Because the whole thing is open source you can put a copy of the bootloader on this chip if you want, and you can use the Arduino IDE whether or not you use the bootloader. In order to learn how to code in Arduino, we recommend the SparkFun Inventor's Kit, you can also check out the manual online if you don't want to buy the kit. The first few lessons are on how to blink and control LEDs which seems to be what you are looking for. You can also check out the code on the Simon Kit which you linked to since that is also written in the Arduino IDE. I've also included a few links for you to check out below, and if you have any other questions feel free to email our techsupport team at techsupport@sparkfun.com. What is the difference between ATMega328 and ATMega328p? What does the "p" mean? To clarify, the P means support for picoPower. Searching the datasheet for that term will help clear up a little more what the differences are. with the picoPower you can decrease the power need by the mcu during some of the sleeping modes (it deactivates the power supply monitoring). It is a deliberate action so if you don't use it the won't change anything. Does the Atmega328 without the "p" support Avrdude SPI? i don't see this part listed on the support device list. Avrdude's 328 setting should work for all 328 variants. The 'p' doesn't affect ISP programming. Double the ram (2k), and eeprom (1k), as well. Does this come pre-loaded with the bootloader??? This does not come pre-loaded with any bootloader or software. We do sell this chip with the Optiboot bootloader as well. This is the same bootloader used on the Arduino Uno and the Redboard. If you are looking for a different bootloader you would need to install it yourself. Once already programmed with a sketch, do I still need the external 16mhz crystal for the standalone atmega328p to run normally? A bit late, but worthy of an answer. The ATMega328 has a built in 8MHz clock, you can use this clock at 8MHz, or divide by 2 or 8 and run it at 4MHz or 1MHz. Or you can use an external crystal (I believe up to 20MHz) which is much more accurate. The fuse bits are what controls whether you are using the internal clock or an external crystal, they also control whether you are dividing that clock or not. The chip does need to be configured to use a clock, and if it is set to use an external crystal and one is not there it will not work. But if you change the fuse bits to use the internal clock it will work. Keep in mind that your code is compiled knowing what clock speed you are using. If that clock speed changes all the timing will change (SPI, I2C, UART, PWM, delay, etc. ), so your code may or may not work right. Does this come pre-loaded with the bootloader? Hello! Please, answer: what difference with using other crystal? For example 16MHz? Can this make some internal errors, or this just make this chip slowly??? 20MHz is the maximum recommended speed., but you can always make these chips run more slowly. Around here we typically run these at 16MHz on 5V, or 8MHz on 3.3V. The slower you clock it, the less power it will use and it will run on lower voltage. Well it depends. Do you mean using this crystal with a 328 with the arduino boot loader on it or just a raw 328? If its the former, you'll need to tweak some settings but it can be done. A Google search for running Arduino on a 16Mhz crystal should give you the info you need.So long as the chip is configured properly for that clock frequency, it should run without a noticeable drop in speed. If I'm wrong, someone please correct me. If its the latter, sure, the chip will run "slowly" (depends on what you're comparing it against though), but 16Mhz is a good frequency for a great many number of things. Depends on your specific use case. Hi! I have arduino uno, can i upload the code using arduino to a ATMEGA328p chip?? Atmel says these have 8 A/D lines. 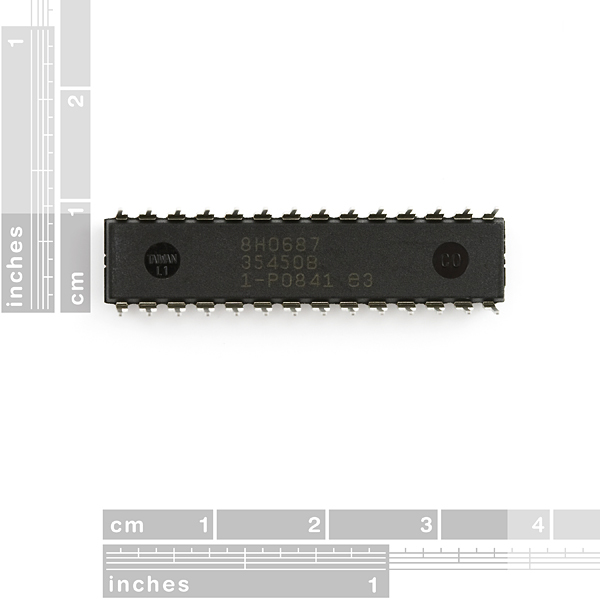 I bought 5 of these chip to reprogram it using my Arduino as ISP. I try to burn bootloader with my MEGA 2560 and my UNO with no success. I always have this error: avrdude: Device signature = 0x000000 avrdude: Yikes! Invalid device signature. Double check connections and try again, or use -F to override this check. I'm sure i plugged it correctly. I put a capacitor between reset and GND too. What is the problem? Can anyone say what are the LOW and HIGH fuse values for Atmega328p to operate at 20MHz WITHOUT bootloader, When I read the fuse from Arduino UNO it showed as LOW FUSE=0xFF HIGH FUSE=0xDE these are the values for supporting bootloader. Nice chip. I just burnt the Arduino bootloader onto it using another Arduino board as ISP. Is this a drop in for the mega168? I can't find any eagle libraries that have this part and I've been scouring for at least two hours. The Sparkfun library does have a 168 in both TQFP and MLF packages though. If they are a direct replacement/drop in and the foot print is the same I will use that when I design the board. I really don't want to have to make my own since I plan on fab'ing these boards and I really don't want to spend 50 bucks on a couple of worthless coasters when I do my first run. 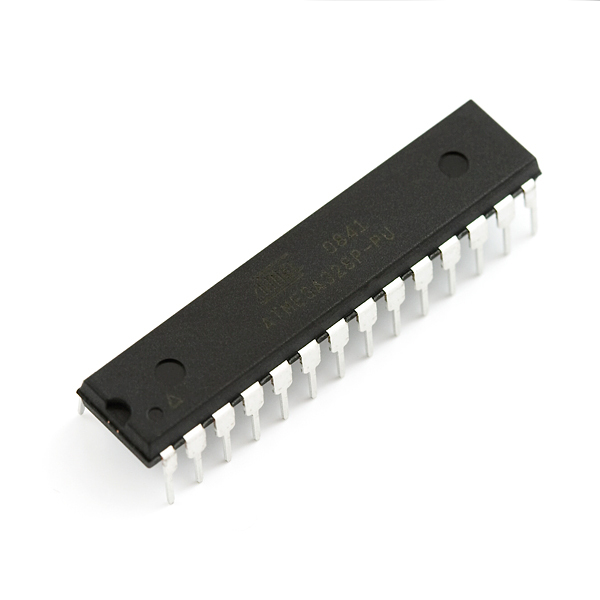 Try the MEGA8-P in the Atmel library. It should have the same pinout as the 328, but (always!) double-check against the 328 datasheet to be sure. I am a beginner and bought the arduino Uno as well as an extra one of these to use with the board. Is it possible to program this Microcontroller using the UNO then remove it placing it on a breadboard to carry out pre programmed code independant of the board ? So no arduino boot loader? If I wanted to use the Arduino dev board with an AVR ATMega328 without the Arduino bootloader (just programming in C), could I still program the chip via the USB connection (with some IDE) or would I need to use the ISP connection and some programmer to program the chip? I believe you can use an ICSP AVR programmer like this on your arduino. You can program one in C that does have the bootloader installed using the arduino IDE, or you can use AVR Studio (or whatever prefered IDE), AVRDUDE, and a command line workaround. There's a good tutorial for that here. If you reset the arduino right after starting AVRDUDE, you'll access the bootloader at just the right time and program your .hex file instead of whatever the bootloader would normally do. Your bootloader is necessary to program over the integrated USB/Serial connections on the board, but this is your best bet if you don't want to buy more hardware. I'm completely lost trying to get the Arduino bootloader on this. I've read about assembling a circuit with the crystal, setting 'fuses', I tried using an Duemilenove with an atmega168 and arduinoISP, still, Even though it says the bootloader was uploaded, when I take it out of the breadboard and insert it into my duemilenove, it won't upload any sketches. Only says stk500 programmer not responding. I'm willing to buy a header/programmer/whatever, this is frustrating. Help? Anyone? Bueller?? I got three of these controllers from here. It's hell of mess. I am trying to use external occilator, the fuse settings i set are LB,HB,EB are FF,D9,FF. Make sure you have the loading caps (22pF) installed also. This could be your problem. Noob question: Can this chip also read serial data that is sent at a diferent frequency than itself (for example 16Mhz)? If yes, also at a higher speed than 20Mhz? It can read the serial data of any other chip as long as the baud rates are the same. All the serial cares about is the baud, not the hertz of the chips. I think 20MHz is the fastest it "can" go, but I think hackaday did some overclocking with this chip... not sure. Is it possible to program this with an arduino uno, or is the bootloader required for that? be what I need to burn in the bootloader myself? Does anyone get this chip work under 3.3V? I can only get it work under 5V 16MHz using Arduino IDE. You can only officially clock it up to 10MHz at 3.3v. High requires at least 4.5v. 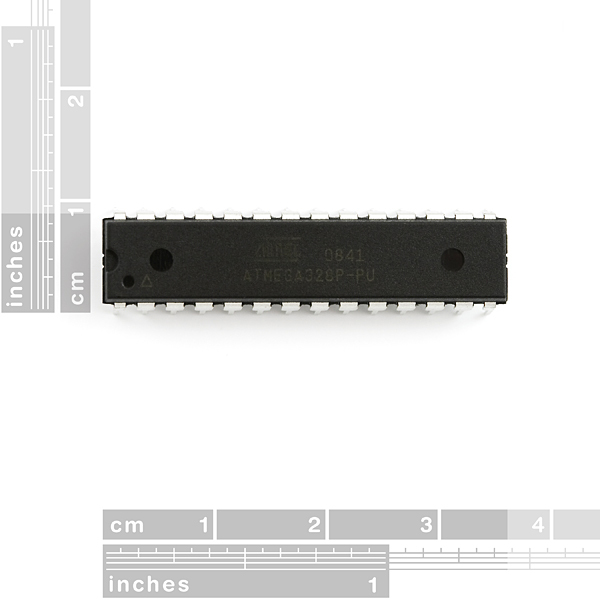 Is this the ATmega328P, or the ATmega328? The datasheet link and picture show the ATmega328P variant, but the description and title here do not reflect this. I have an application where the low power of the P variant matters. I had just recently purchased this, and the one I received was the ATmega328P. If you send an e-mail to customer service, they can probably confirm this for you. edit edit: all gone :( sheesh people! they lasted all of one day! Were you able to program these using that method? Now available! I <3 SFE!! This chip is pretty awesome! I bought an Arduino as well as one of these. It comes set for the internal oscillator so all you have to do is throw it on a breadboard, feed it 5 volts, and hook up a programmer. You can program it using an Arduino using "Mega-ISP" (which emulates an AVRISP programmer with an arduino, just have to connect some Arduino pins to the 328's programming pins and use avrdude to write code to it). I also built a cheap "dapa" parallel programmer with around $5 worth of RadioShack parts that works fine. Flashing the bootloader to use this with an Arduino can be accomplished using any programmer (including the Arduino running Mega-ISP) so if you have a working Arduino you can save a bit and flash it yourself. Does this have the arduino bootloader installed like the 168 does? If not could I request that you guys fork this product to have one with the arduino bootloader preinstalled? How can I get one or three with a bootloader installed? Does it work with the Arduino? I am not going to laugh, just to be considerate, but YES. this is the chip that is on the arduino, you could unplug the chip on your arduino and plug this one in. Actually, it needs to be bootloaded before it will work with the arduino. And please don't be so rude to people - especially since the comment is almost two years old and that was back when all arduinos were shipped with atmega168's rather than the 328 sold here. But yes, they can be made to be arduino-compatible. i fried my 328 in my duemilanove and i went on here to order a new on and they stop selling duemilanoves. so i searched atmega328 and the only chip i got in my results was the atmega328 with optiboot for uno. i already ordered that chip and today i came across this and now im worndering if the chip i ordered is going to work? does it matter which atmega328 i use, as long as the bootloader is correct? I attempted to combine the entries for the duemilanove and uno. It should then show up in the tools->boards menu. D*** underscores... oh well, I'll try it. Actually that will probably not work. I've heard just using the uno setting is fine. You can always burn a new bootloader as well. I breadboard these guys all the time. Just pick the right target board (if using 1.0 you can pick Duemilanove w/ATMega328). You can use either an ISP or another arduino board as an ISP to burn the bootloader (the latter is a good option if you don't have an ISP already). You can get an AVR MkII ISP for about 30 bucks. The bootloader and wiring-based language are a construct of the arduino environment. The wiring-based language just abstracts the hardware and pin outs of the devices, nothing more. You can still drop to bare metal whenever you need to, such as burning a new bootloader. To help build your confidence/comfort level, you might want to try picking up an Ardweeny kit for about $10 (http://www.diybin.com/products/Solarbotics-Ardweeny.html). You will have to spend another $14 on an FTDI (http://www.diybin.com/products/DFRobot-FTDI-Basic-Breakout-3.3-5V.html), which brings the total up to about the cost of an Ardunio on sale. But the FTDI is a one-time purchase - in the future all you'll need to buy is the Ardweeny. In fact, once you've seen the schematic for the Ardweeny, you'll probably just want buy the parts and assemble your own - that will lower the price to about $7 per project. At that point, you'll probably start buying in bulk to save on shipping! I configured mine to run with 8MHz crystals because I have too many. No problems at all. Can also be set to use no crystal. Works as expected and is very forgiving. As the title says, not only did it work as expected, but it is also decently forgiving if you happen to wire things up wrong. I put it in my Arduino Uno but it's not working. Maybe it doesn't work with Arduino Uno so this is not a negative review more of a precaution. This is the bare chip without the Arduino bootloader on it. Check out this tutorial which goes over installing a bootloader on a board or chip as well as programming a bare chip (it is the same process for the most part as the bootloader is just a program).